Armenianness is defined by the unified existence of Armenia, Artsakh and the Diaspora. Thus, our Homeland is stronger with its Diaspora, while the Diaspora is stable with its free Homeland. The Armenian Church, schools and community centres are the strongholds that operate in order to stand strong against complete integration created by globalization. Holy Trinity Armenian Apostolic Church of Toronto one of these lighthouses, celebrated the 90th anniversary of the establishment of its parish on December 1, 2018, at the «Magaros Artinian» hall. 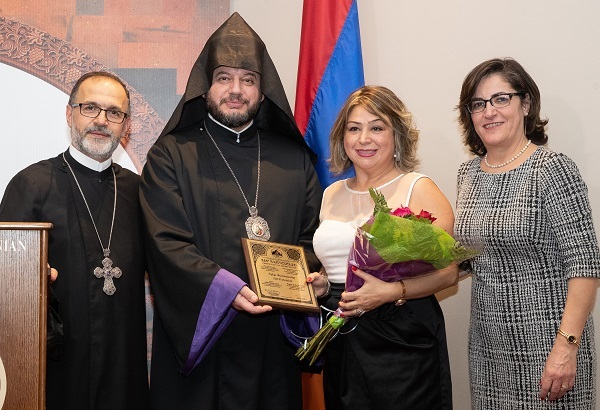 The celebration was under the auspices of His Grace Bishop Abgar Hovakimyan, Primate of the Armenian Holy Apostolic Church Canadian Diocese. 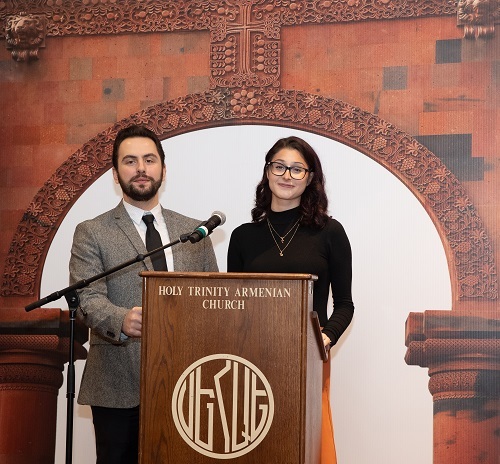 After the rendition of the national anthems of Canada and Armenia, Miss Naré Shahmouradyan (English) and Mr. Diran Parnakoglu (Armenian) made the opening remarks. Very Rev. Fr. Yeghia Kirijian conducted the blessing of the tables. Seated at the table of honour were His Grace Bishop Abkar Hovakimyan, Primate; Rev. Archpriest Fr. 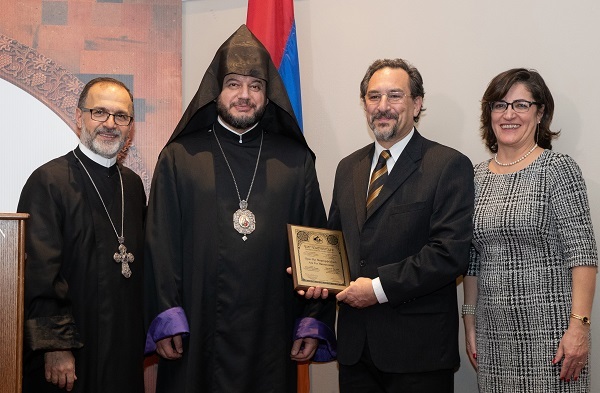 Zareh Zargarian, Vicar of the Diocese of Canada and Parish Priest of Holy Trinity Armenian Apostolic Church; Yeretsgin Naira Zargarian; Mr. Ohan Ohannessian, Chairperson of the Diocesan Council; Mrs. Rosine, Chairperson of the Parish Council and Mr. Apic Imasdounian; Mrs. Sella , Chairperson of the Women’s Guild, and Mr. Levon Kaltakjian; MPP Scarborough Agincourt Mr. Aris Babikian. Also present were Rev. Fr. Yeghia Kirijian, pastor of St. Gregory Armenian Catholic Church of Toronto; Rev. Fr. Harold Nahabedian of the Anglican Church; Mr. Hagop Janbazian, Chairperson of the Inter-Denominational Committee. Representatives of different organizations, former Parish Council members, godfathers, benefactors and members of the community were also attending. About 40 students of Grades 6-8 of the St. Sahag-St. Mesrob Saturday School rendered three songs conducted by Mrs. Nata Navasartyan. 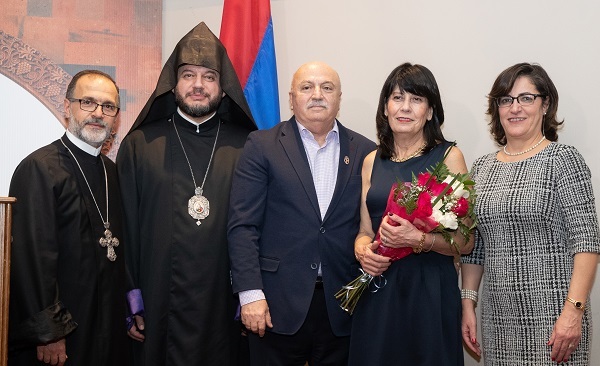 In her welcoming remarks Mrs. Rosine Imasdounian said that the establishment of Holy Trinity Armenian Church as a house of faith was the realization of the dream of a handful of Armenians. The attendants later watched a documentary prepared by David Ter Haroutunian. 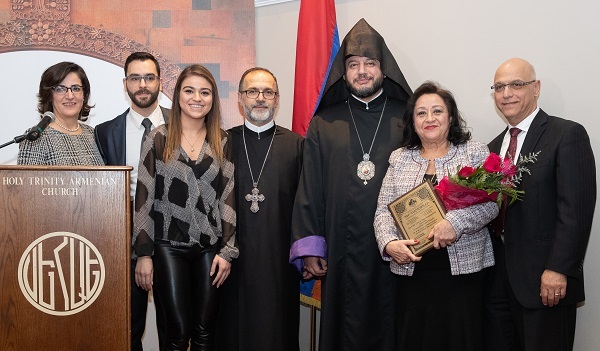 Ms. Knar Basmajian, the representative of the «Babayan» Foundation, delivered a brief speech and passed on the Foundation’s donation to the Diocese and Holy Trinity Armenian Apostolic Church. 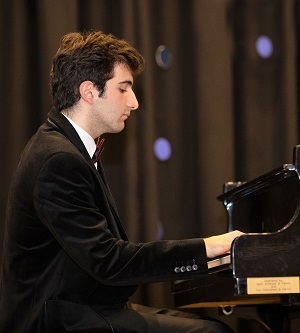 Mr. Artoun Miskjian played musical pieces by Komitas and Charles Aznavour on the piano. Next, Mr. Ohan Ohannessian, Chairperson of the Diocesan Council, delivered his speech on the 90th anniversary of the church, passing on his best wishes. 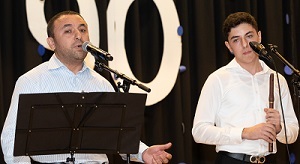 Following this, son and father Nver and Seyran Ghazaryan created a wonderful atmosphere by their rendition of musical songs accompanied by duduk. Members of the «Sassoun» Ensemble lightened up the spirits by presenting a few dances under the professional leadership of Sevag and Sareen Avakian. The audience highly appreciated their performance. Mr. Zaven Khachikyan, a photographer from Armenia, congratulated the audience on the 90th anniversary of the church. He thanked the members of the committee who had organized an exhibition of his works in Toronto. He also explained the story behind the photo that was on the silent auction that day. Rev. Archpriest Fr. 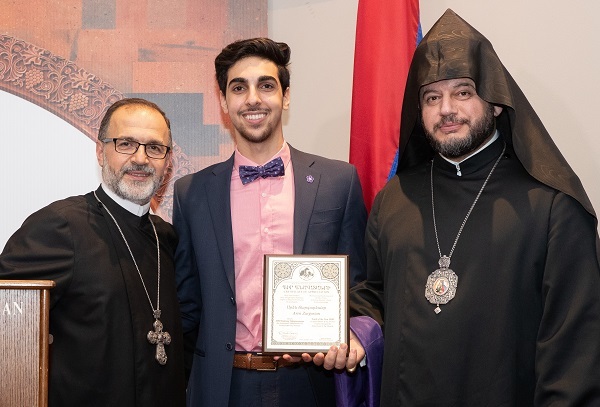 Zareh Zargarian emphasized the important role Holy Trinity Armenian Apostolic Church has had over the years in the life of the Armenian community in Toronto through its spiritual, educational and cultural input. 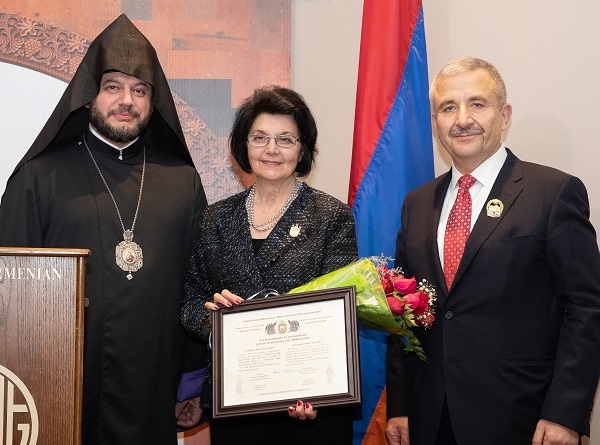 By referring to the importance of the structure as a legacy left to us, he added that it is essential to keep and support the Armenian Church which has been a home for many generations and new Armenian families. Rev. Archpriest Fr. Zareh Zargarian also thanked His Grace the Primate, the parish priests present, members of the Diocesan and Parish Councils, the organizing committee of the 90th anniversary, the committees of the church, the secretaries, the volunteers, the caretaker as well as the sponsors and the audience. Seven members of the Parish Council, whose term was completed, were recognized for their dedication by His Grace the Primate and the Rev. Archpriest. Certificates of Appreciation were given to Ms. Yvette Panossian – Woman of the Year; Mr. Ara Ter Haroutunian – Man of the Year; Miss Naré Shahmouradyan – Young Woman of the Year; Mr. Aren Zargarian – Young Man of the Year; Mr. and Mrs. Levon and Sella Kaltakjian and their children Sako and Elize – Family of the Year. The highest award of Holy Trinity Armenian Apostolic Church, the Holy Cross medal, was awarded to Mr. Jack Stepanian for his many years of dedicated input. Mrs. Apet Alpay was awarded the Diocesan Holy Cross medal for her long years of service. The 90th anniversary cake was cut by His Grace the Primate, the Parish Priest and the members of the Parish Council. His Grace Bishop Hovakimyan made the closing remarks. 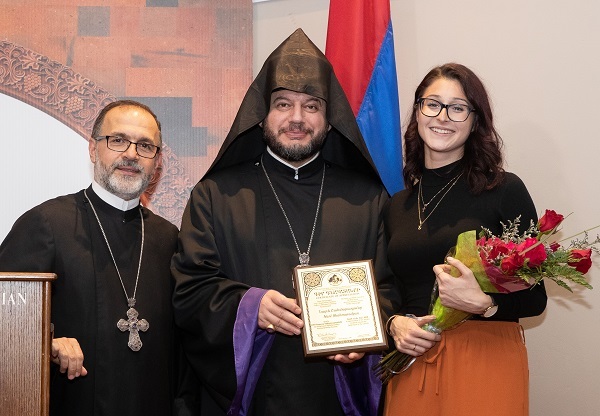 He congratulated those who were recognized for their dedication and encouraged the members of the community to continue supporting the Armenian Church. He also appreciated the efforts of Archpriest Fr. Zareh Zargarian and the Parish Council. He added that on Sunday, Decemeber 2, at the end of Liturgy he would be reading the Encyclical by His Holiness Karekin II addressed to Fr. Zargarian for his 22 years of service and the 27th anniversary of his ordination.